Sundae:1. Place 3 pieces of fig in the bottom of a large sundae glass. Cover the figs with 2 scoops of ice cream. Place 3 more fig pieces over the ice cream along with 1/4 cup strawberry topping. Add 2 more scoops of ice cream topped with the remaining 1/4 cup strawberry topping. 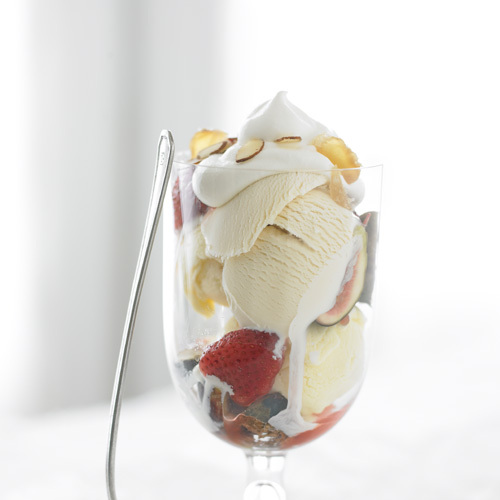 Garnish the sundae with the whipped cream, sliced almonds, candied ginger, and remaining fig pieces.Topping:1. Slice the berries in half (or into quarters if they are very large) and place them in a large, heavy non-reactive saucepan with the sugar and lime juice. Toss until the berries are well coated with sugar. Set aside for 2 hours or until the berries have released their juices.2. Place the pan with the berries over medium heat. Stir until the sugar is completely dissolved and the mixture comes to a simmer. Add the almond extract and candied ginger. Cook, stirring frequently, for 10 minutes.3. Remove the pan from the heat and skim any foam that has formed. Stir in the almonds and allow the topping to cool. Refrigerate the topping for at least 2 hours before using.4. The topping may be kept tightly covered in the refrigerator for up to 1 week.